Another week, another hard drive. This one is the Glyph Studio. As the name suggests, this powered hard drive is squarely aimed at creative professionals, be they musicians or film makers. We’re going to be testing the 1 TB version, which retails for $199 online. There’s 2 TB, 3 TB and 4 TB versions, with the most expensive model setting you back $389.00. The desktop external drive sphere is a crowded one, and the Glyph Studio compares unfavorably to other drives in the same price point. You can get a 1 TB Seagate Expansion drive for $69, and a slightly gratuitous 4 TB Western Digital My Book for $139. So, why pick the Glyph Studio? The manufacturers hope you’ll be willing to spend a little bit extra for a device that is not only built in the USA, but comes with a generous warranty and is sufficiently speedy. But does it deliver? The Glyph Studio is a mains-powered hard drive. It supports connections over USB 3.0 with a square Type-B connector, in addition to eSATA and Firewire 800. Much like the Glyph Blackbox Glyph BlackBox Portable Hard Drive Review And Giveaway Glyph BlackBox Portable Hard Drive Review And Giveaway Can a 500gb portable hard drive really be worth $100? There's a company in New York who thinks so. 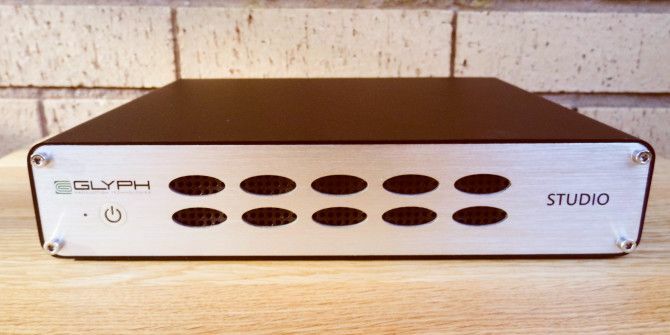 Meet Glyph Technologies, the makers of the BlackBox. Read More , this comes formatted with the HFS Plus file system From FAT To NTFS To ZFS: File Systems Demystified From FAT To NTFS To ZFS: File Systems Demystified Different hard drives and operating systems may use different file systems. Here's what that means and what you need to know. Read More , which is the default for systems running Mac OS X. A sensible choice, given the target audience. HFS Plus can support files as large as 8 exabytes. Ideal for those large masters or RAW files. The downside of HFS+ is that it doesn’t work out-of-the-box on Windows systems. Just getting read-only access would require you to install a third-party driver from Apple. However, you are able to reformat it, should the need arise. Given that it’s quite plainly aimed at Mac users, it’s a genuine surprise that there’s no Thunderbolt support. Apple computers have shipped with Thunderbolt connections for a long time now, and it’s almost twice as fast as USB 3.0. They’re also arguably more common than eSATA connections. The drive comes in bulky, big packaging. Inside the box is USB 3.0 Type B, and Firewire-800 cables. There’s no eSATA cable to speak of; an exclusion as strange as the inclusion of an eSATA interface itself. Also included is two power cables. There’s a three-pinned Type G power cable, used almost exclusively in the UK and Ireland, as well as a Type C cable commonly used in Europe and elsewhere. I assume the US version would contain a US power cable. The Glyph Studio is a heavy beast, and occupies a large desk footprint – hardly surprising, given that inside its thick metal casing is a full-sized, 7200 RPM hard drive. Don’t expect to slip this behemoth into your jeans pockets; it’s definitely not a portable drive. To give you a bit of context to its impressive dimensions, the manufacturer boasts that it can be mounted in a server rack, sold separarately for about $50. However, for all its bulk, it’s no eyesore. The front facia contains a small, aqua-blue LED power light, air-vents and a power button. These are cut into a single sheet of metal, giving it a smooth, industrial aesthetic. Meanwhile, the rear is much more utilitarian. It contains the power socket, as well as the data connection ports and an air vent. This is to dissipate the surprising amount of heat generated by the drive. The Glyph Studio is a pretty impressive piece of kit, well suited to its target audience of creative professionals. It’s unambiguously a premium (read: expensive) product, aimed squarely at those with deep pockets. But those willing to drop the cash for it will not be disappointed. In addition to its rugged, stylish facade, it’s also blazingly fast. Admittedly, not as fast as a Solid State Drive (SSD), but as fast as you can expect for disk-based external storage. That’s partly due to the 7200RPM drive in found within its chassis, which is backed up with 62MB of cache. In real terms, it can handle anything you throw at it. When connected over USB 3.0, read speeds hover around 190MB/s, whilst write speeds tend average out at 180MB/s. That’s more than adequate for streaming ultra high-definition content, as well as for everyday storage tasks. In addition to being a bit of speed demon, the Glyph Studio comes with a phenomenally generous warranty. If your drive breaks down after one year, Glyph will overnight you a new unit. If it breaks down after two years, they’ll try to recover your lost data. And if it breaks down within three years, they’ll repair or replace the drive. It’s the same offering they had for the Glyph Blackbox. We were impressed then, and we’re impressed now. There’s a lot to like about the Glyph Studio. In addition to being phenomenally well built, it also looks the part, with a well-designed industrial aesthetic. It’s blazingly fast, and can keep up with whatever you throw at it. It also comes with a warranty that’s unparalleled in its generosity, which should be of great reassurance to anyone who picks up a drive. That said, it’s expensive. Really expensive. And for most consumers, they probably won’t see the benefit of that extra $120. MakeUseOf Recommends: The high price puts this firmly out of the realm of anyone except professionals – look elsewhere if you just need lots of extra drive space. How Do I Win The Glyph Studio? Explore more about: Hard Drive, MakeUseOf Giveaway.